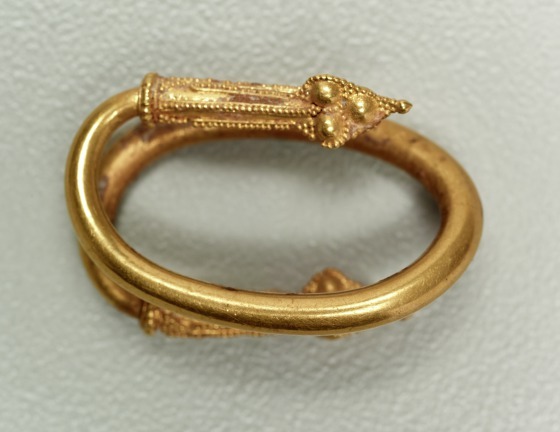 One of the most popular types of Archaic Greek ear ornaments, known from pictorial representations as well as from actual finds, is exemplified here by a single ear spiral. Originally one of a pair, this spiral is formed of a thick wire. The ends are turned upward and mounted with an elongated ornamental cuff and a pyramid of globules. Both the cuffs and the pyramids are embellished with granules, arranged in single rows and triangles. A beaded-wire circlet accentuates the base of the cuff. 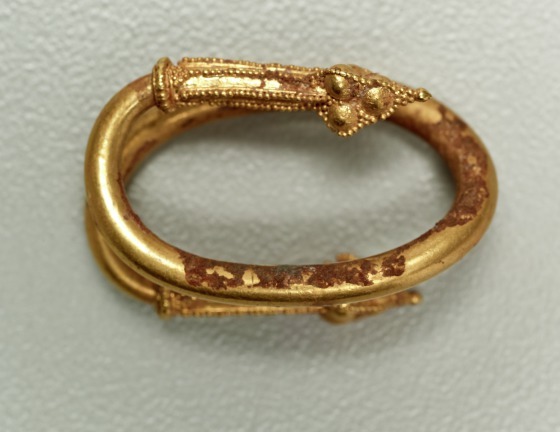 Spirals in general have a long history in Greek jewelry, with the first examples dating to the 9th century BCE. Their use as ear ornaments has been disputed, but representations on coins prove that even bulbous spirals terminating in three-dimensional rams' heads were thrust through a hole in the earlobe (1991.75.49.a-b). The difference between this single spiral and the later rams' heads pair illustrates the development in Greek jewelry from comparatively simple shapes and discreet supplementary decoration, to more elaborate forms and ornate designs. 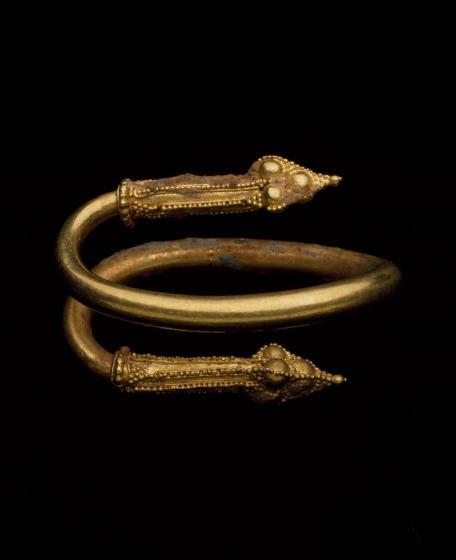 Barbara Deppert-Lippitz, Ancient Gold Jewelry at the Dallas Museum of Art (Dallas: Dallas Museum of Art in association with the University of Washington Press, 1996), 61-62, 131.